He’s the biggest star of the new Millennium in Britain sometimes controversial, often egotistical, occasionally charming, an idol not only to teen girls, but also their older sisters and mothers. He’s virtually unsurpassed as a solo male artist, with millions and millions of albums sold, six number one singles, and records for fastest ticket sales for his concerts. Robbie Williams is the king. After leaving Take That in 1995, Williams talked a lot about his solo career. But plenty of time elapsed before he actually did anything about it, as he spent much of his first 12 months after the band hanging out with Oasis. When he did finally put out a record, the famed change of direction proved to be nothing more than a cover of Freedom, the ‘80s hit for George Michael, although it proved hit material for Williams, too. It wasn’t until 1997 that he released his first solo CD, Life Thru a Lens, which catapulted him to the top with five hit singles, including the now-classics Angels and Let Me Entertain You. A year later brought another album, I’ve Been Expecting You, which gave Williams his first number ones with Millennium and She’s The One. 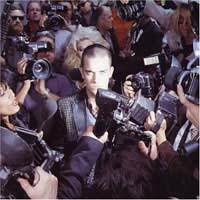 By now there was no doubt that Robbie, as all his fans called him, was a full-fledged star, followed avidly by the media. It was two more years before Williams’ next CD, Sing When You’re Winning, which brought not only two more number one singles, but also a duet with Kylie Minogue, and the inspiration for Swing When You’re Winning, which arrived in 2001 as a complete change of pace. Here Williams shed his pop star persona to tackle a number of classic pop and standard tunes, including Beyond The Sea and the Frank and Nancy Sinatra ‘60s hit, Somethin’ Stupid, which he performed with Australian movie star Nicole Kidman (the single became his fifth number one hit). The record showed he was striving for something, to escape a little from the constraints of pop. Musically, however, that wasn’t too evident on 2002’s Escapology, arguably his weakest release to date. It brought the usual crop of hit singles, but offered nothing new in terms of forward movement. The same was true of Live at Knebworth, a document of three sold-out concerts which was effectively just a live greatest hits collection, and then Greatest Hits in 2004, another holding action, although it did have two new songs, with Radio going all the way to the top. By now Robbie was completely public property, and like many stars, he had no choice but to battle his demons in public. He admitted to depression and alcohol abuse (although he’d been sober for a few years). Despite many attempts, he’d never become a star in the U.S., but he did make his home in Los Angeles, far from everything he knew. Intensive Care was Williams’ 2005 comeback after three years without any real new material, and it proved to be the best-selling album of his career. He might have been out of the musical spotlight, but his fans hadn’t forgotten him, by any means, as it went to number one. This time around, though, there were no number one singles, and one even failed to reach the top twenty, leaving critics wondering if Williams was starting to pass his sell-by date. It appeared not, when he brought out the adventurous Rudebox in 2006, with the title track, harking back to ‘80s dance music, rising to number four. The album, aimed more at the dance floor than his previous efforts, proved to be another hit. Williams seems to remain an unstoppable force, and these days seems to be almost more of a cultural icon than a pop star, a British institution who prefers to make his home abroad.